So what the F is up with Lady Sovereign? The first time I heard “her” song and saw “her” video I actually thought it was a joke…like a skit. I kinda figured it was like a Weird Al type of song, but then I realized it was actually real and not a joke. What is even more shocking is that she is signed under Jay Z’s label. I know! Go figure. Her song “Love Me of Hate Me” literally makes no sense to me. Is she swearing? Is she just British? Is she rapping? Wait, is that really Sporty Spice? Now I know where I saw her before! I think by now you all know how I feel about a British accent. Yeah, it kinda makes me nauseous. I know, I’m ignorant. Oh well. But not only does she have a British accent, she raps with a British accent. Oh, and she has my eyebrows too. Being British I just assumed she would have bad teeth and, luckily, the stereotype was true. As soon as she makes some money off this song she should get her “teef” fixed. 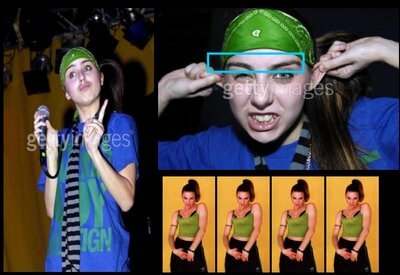 Again, Lady Sovereign will totally just be a flash in the pan. We didn’t like it the first time we saw her….when she was Sporty Spice. Now head on back to England..pip pip! So, Wait. Is Lady Gaga Not Really Paris Hilton?